Here are some things that might prove useful or interesting. If you like them, use them; if not, ignore ’em; and if you find errors, please let me know. Anything with “MJW” in the filename is a scan of a page from my notebook. Beware that I drew these for myself without the intention that they would ever be seen by anyone else, so I often omitted structures that weren’t directly relevant to the day’s dissection, or that I already knew cold. Think of these more as explanatory diagrams than encyclopedic references. Ideally, you should make your own sketches; even if all you do is slavishly copy a picture from an atlas (which is how most of my drawings started), you’ll at least engage your sensory and motor neurons, and hopefully learn the material better. 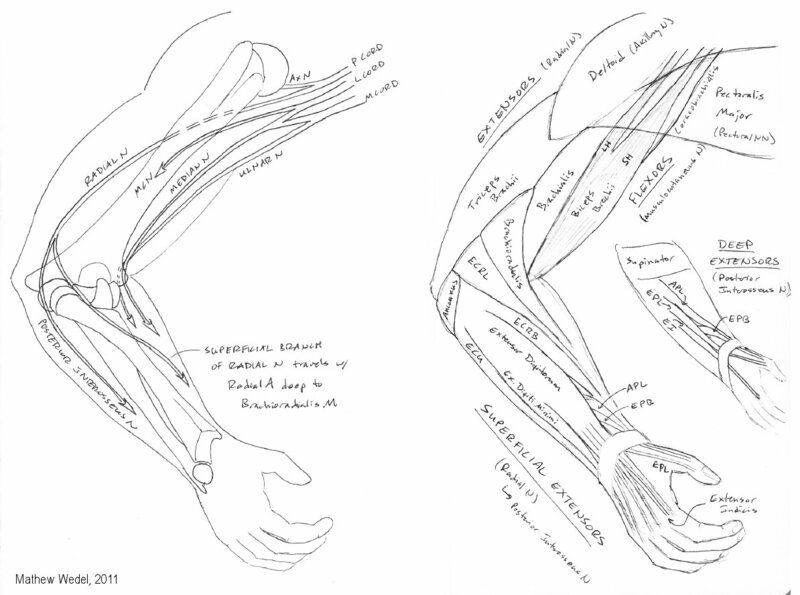 Most of the “Color Your Own” diagrams I made by taking public domain images from the 1918 edition of Gray’s Anatomy (free online here), modifying them in GIMP (also free), and dropping the contrast. The idea is that one can use them as templates for drawing on ligaments, muscles, vessels, nerves, and so on. Spinal cord meninges and filum terminale slideshow v2 – MJW 2016 – quick sketch to show the fates of the meninges at the end of the spinal cord. NB: updated 2016-08-12. Autonomic nervous system sketches 2015-09-02 – sketches from office hours and lab today. I’ll probably pretty these up and put them into a review slideshow for thoracic autonomics. Review of thoracic and abdominal autonomics – MJW 2015 – hey look, I did! Foregut and midgut sketches MJW 2011 v2 NB: updated 2013-07-09. Male and female perineum sagittal sections 2015-09-25 – Like the slideshow above, but with the pubic symphysis, erectile tissues, urethra, etc. drawn for both sexes. Leg and foot sketches 2014-10-02 – This is a bundle of 7 pages of sketches that came out of my group office hours on Thursday, Oct. 2, 2014. No systematic approach here, just whatever students had questions about and I needed drawings to explain. Hip and inguinal sketches 2014-10-03 – Same story as the above: 2 pages from office hours the next day. Pharyngeal arch cheat sheet v3 NB: updated 2012-10-22. OK, you invited corrections, On the cranial nerves you abbreviated CN 8 with a V, shouldn’t that be an A for auditory? Excellent, helpful materials,BTW, I wish I had found these a little earlier when I was teaching vert anatomy last term. V is for vestibulocochlear. I know auditory is also in play for that nerve, but I prefer vestibulocochlear, because auditory is sometimes also used for just the cochlear component. Vestibulocochlear explicitly includes both the vestibular and cochlear nerves. Thanks for the catch, though, it’s good to be reminded that not everyone learned these by the same names I did. Keep ’em coming! agreed, Vestibulocochlear is clearer, however it kind of stuffs up the mnemonic “On Old Olympus Towering Top….” which was about the only way I could keep these damn nerves straight in my head, and find myself repeating over and over as I work my way through a fossil braincase I have right now. Ah, well, you need to have someone teach you, “Oh Oh Oh, To Touch And Feel…”. Not a student, if you want to keep your job, and not me, because this is a family blog. Cranial nerve VIII also leads to the lateral-line organ when that is present, right? Good on ya. I agree, mnemonics are at best a crutch; eventually one must stand and walk unassisted. There seems to be some diversity of opinion on this in the literature. Some authors describe lateral-line nerves as part of CN VIII, but from my brief scan of things I think more authors describe the lateral-line nerves as separate nerves apart from the classic 12 cranial nerves (see, e.g., the McGraw-Hill Science & Tech Encyclopedia entry here). As I’m sure you know, the classic list of 12 nerves is an imperfect description of the actual complexity of what comes out of the brain (and spinal cord, in the case of the spinal accessory nerve). Unfortunately my Liem et al. vertebrate anatomy textbook is packed up where it’s not readily accessible. I know it’s a textbook with all that that implies, but generally I’ve been impressed with how up-to-date and complete it is, and I’d like to see how they handle the identifications and functions of all the cranial nerves–the classic 12 and the oddballs.